Based on a condensation of three chapters from the book Prophets of PsychoHeresy II, this is a critique of some of Dr. James Dobson's psychological theories and practices which are not in conformity to God's Word. Dr. Dobson is one of the most influential spokesmen in evangelical Christianity. But can he be trusted without question? 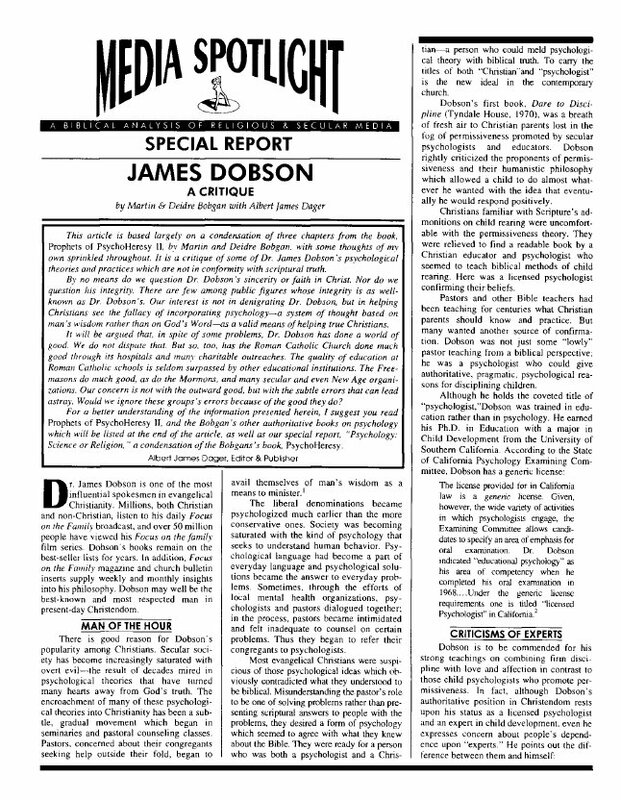 This report will open eyes to the truth of psychological integrationism as taught and practiced by Dobson. Of late the true Gospel-the message that all men may find salvation from sin and from the consequences of sin only through faith in Jesus Christ and His sacrifice for their sins-has come under greater at tack. That's nothing new, you say? True. The world has, since the beginning, attacked the Gospel. Even religious people, particularly among liberal theologians in the churches, have attacked the Gos pel. 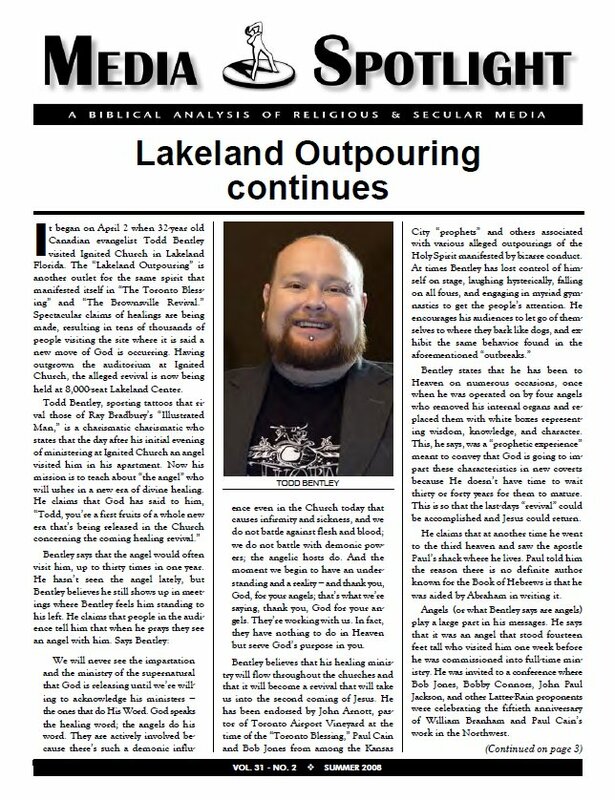 But the attack of which I speak is in creasingly com ing from those within the evangelical camp of Christianity-those who claim to believe all the truths of Scripture regarding man's lost con dition and his need for Jesus Christ as his Sav ior, but who feel compelled to compromise those truths for the sake of seeking common ground with others. 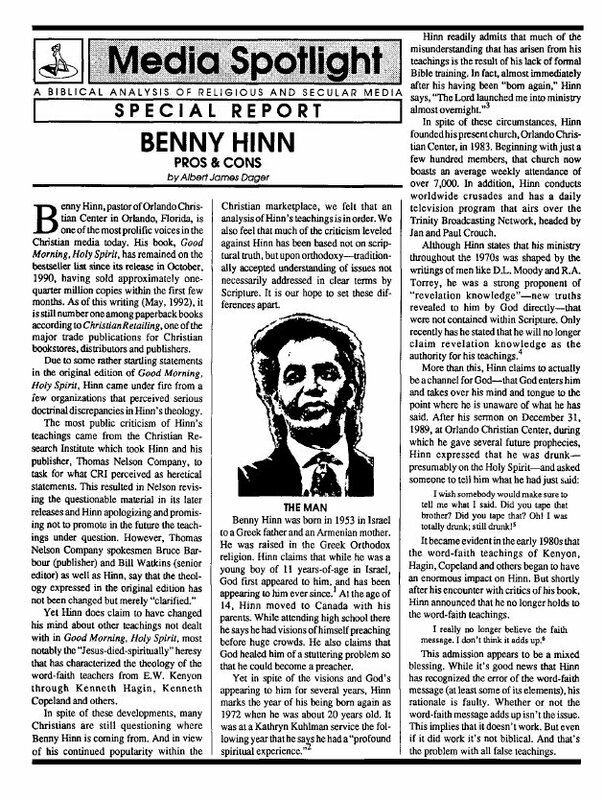 Benny Hinn, pastor of Orlando Christian Center in Orlando, Florida, is one of the most prolific voices in the Christian media today. Yet he has come under fire for some of the most outlandish statements and unbiblical teachings in recent memory. In some cases, we believe he has been misunderstood; in other cases the criticism is justified. This study is an objective look at Hinn's more controversial statements. One of the most revered men among Christians today, C.S. Lewis was nevertheless steeped in mythology and fantasy. On one hand he produced brilliant apologias for the Christian faith. On the other hand he wrote profusely about fantasy and myth. Even though he denied that his writings were Christian allegory, his fans insist on presenting those writings as such. 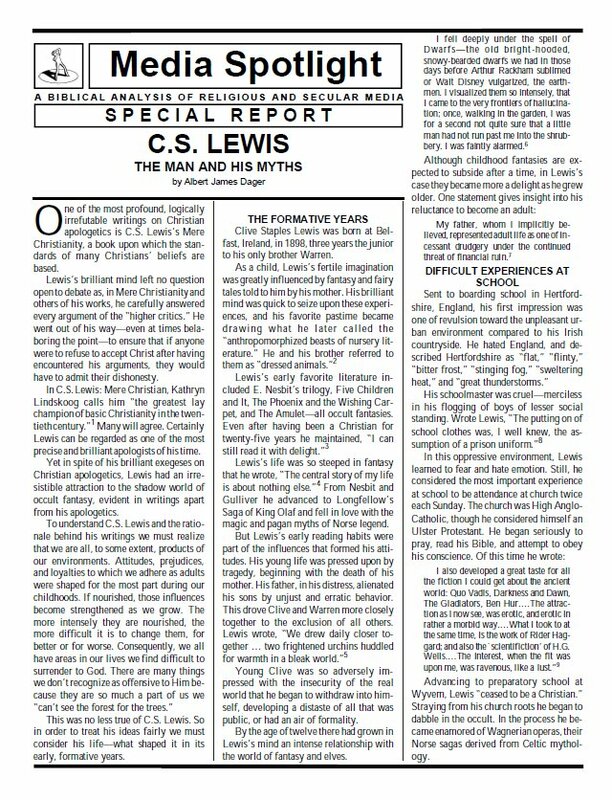 This study looks at these issues objectively and offers some help to Christians who don't know what to make of Lewis. 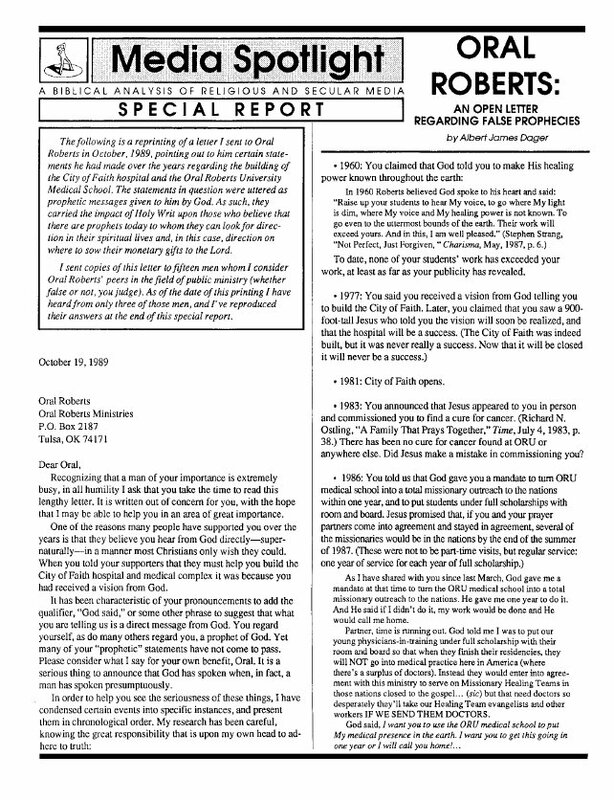 This is a reprint of a letter sent to Oral Roberts in October, 1989, pointing out to him certain statements he had made over the years regarding the building of the City of Faith hospital and the Oral Roberts University Medical School. The statements in question were uttered by him as prophetic messages given by God. As such, they carried the impact of Holy Writ upon those who believed him. 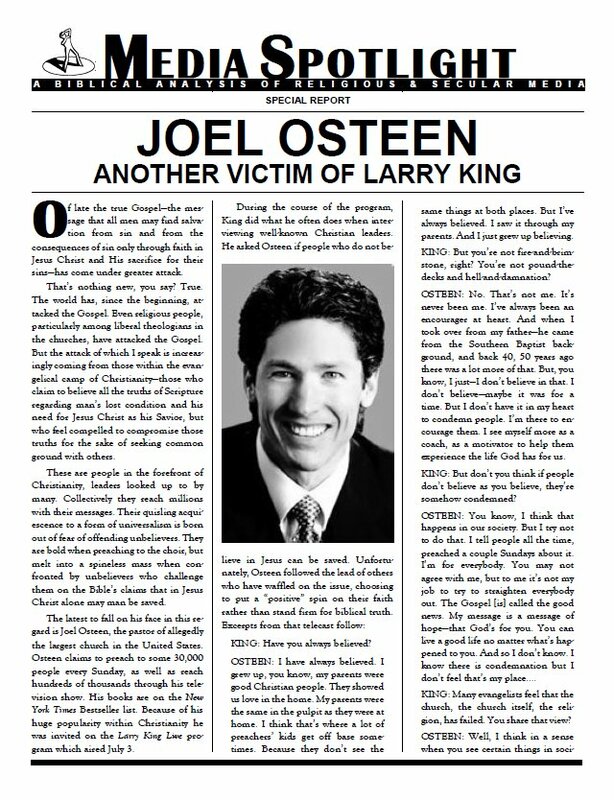 I sent copies of this letter to fifteen men whom I considered Oral Roberts's peers in the field of public ministry (whether false or not, you judge). Three of those men responded, and their answers are reproduced at the end of this report. REBECCA & ELAINE - Can Christians Be Demon Possessed? 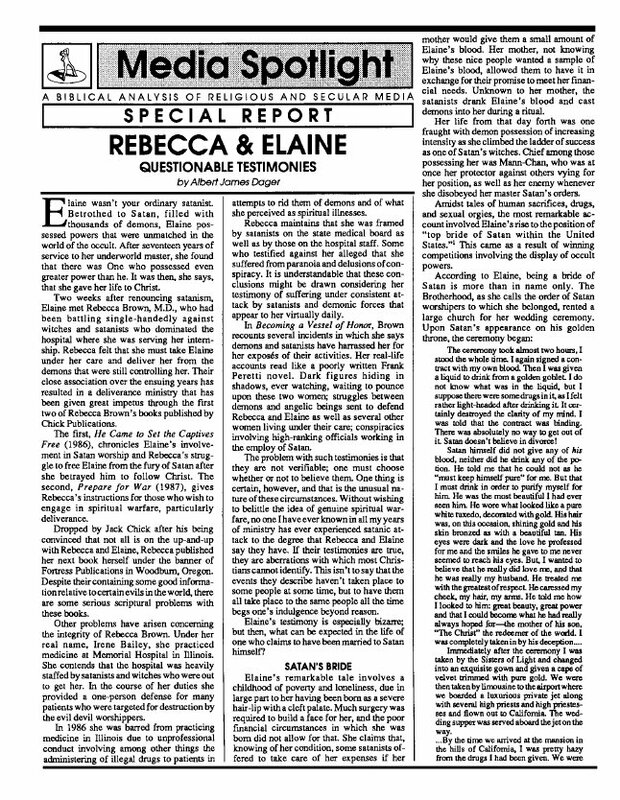 Rebecca Brown (aka Irene Bailey) and Elaine (last name unrevealed) took the charismatic world by storm with their fantastic tales of satanism, demonic attacks and otherworldly experiences. Elaine was allegedly chosen by Satan himself to be the mother of his son, the anti-Christ. Can we believe the fantastic stories? Or has it all been a scam? This report reveals some discrepancies and questionable teachings from these women. 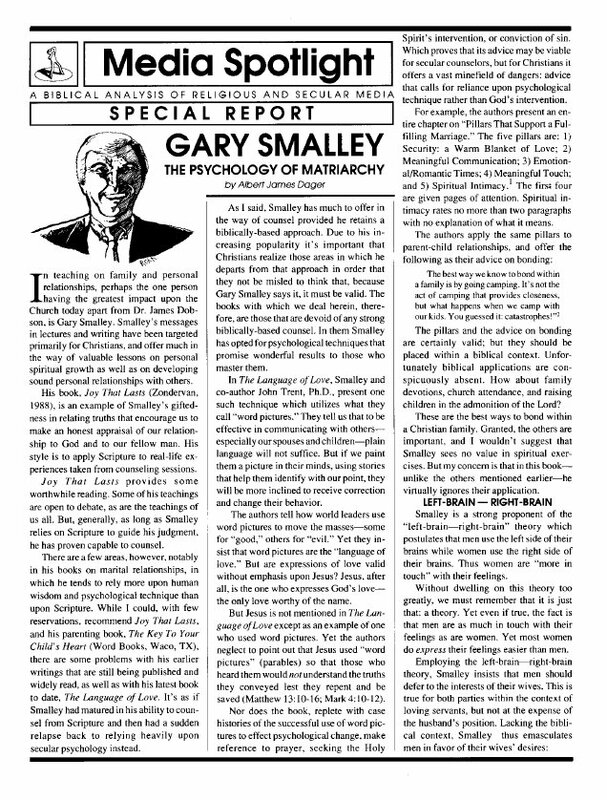 In teaching on family and personal relationships, perhaps the one person having the greatest impact upon the churches today, other than James Dobson, is Gary Smalley. But how trustworthy is this man? This study reveals some startling truths about his counsel to wives on how to manipulate their husbands and even lie to them to get their way. Smalley's feminist psychological integrationism reveals the great dangers to biblical faith his teachings present. made, resulting in tens of thousands of people visiting the site where it is said a new move of God is occurring.